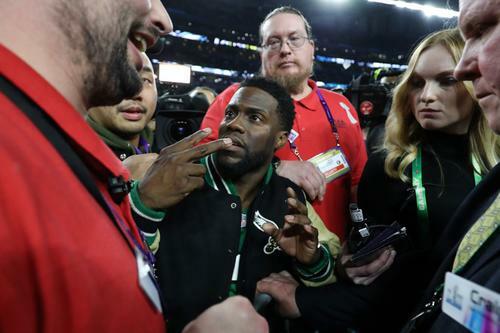 Kevin Hart made an appearance on Conan last night and explained exactly what was going through his mind after the Philadelphia Eagles beat the New England Patriots in Super Bowl LII. Specifically, Hart addressed his drunken shenanigans which included trying to get on the podium as the Eagles were being presented the Lombardi Trophy, and dropping and F-bomb during his brief appearance on the NFL Network. As the Philly-native explains, he had been drinking and partying with his wife and some hometown friends in a suite throughout the entire game. Once the Eagles had won, he made it his drunken mission to get on the field with the team and get his hands on the Super Bowl trophy. Hart says he managed to get onto the field simply by yelling, "I'M KEVIN HART!" at anyone who attempted to prevent him from his master plan, but, as we know, he was ultimately thwarted by a security guard standing by the steps to the podium. Check out Hart's play-by-play events below.